Mrs. Catherine Prehm Terry, who has lived in the atmosphere of a newspaper office most of her 70 years, is proud of an adventurous career, but most proud of her claim as the first woman linotype operator. Mrs. Terry, who in her day has been an editor, publisher and embalmer, as well as printer, says she was taught to operate a linotype machine by the late great Otmar Mergenthaler, its inventor. She was 22 then, working in the composing room of the Baltimore American, when Mergenthaler asked her to come to his factory and study the machine to determine if it could be operated by women. The pioneer typesetting machines were faulty, she explained, and “squirts” of hot lead that seared her arms and hands were frequent. She still carries scars from this experience. Other “firsts,” Mrs. Terry claims include: The first girl editor in Iowa, when she was 17, on the Eagle Grove Times, a weekly she inherited. , First woman admitted to the Denver local of the Typographical Union, when she was 19. First woman to work in the composing rooms of the Savannah, Ga, News and the Baltimore American, Philadelphia North American. Chicago American, Denver Post and other large papers. 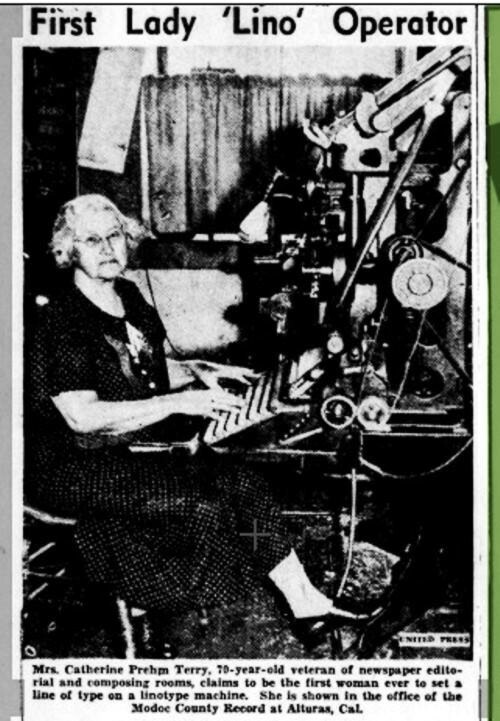 She operated several weeklies In Western and Middle Western states, and now owns the Klamath Free Press, a weekly published in Bonanza, Ore.
Mrs. Catherine Prelim Terry, 70-year-old veteran of newspaper editorial and composing rooms, claims to be the first woman ever to set a line of type on a linotype machine. She is shown in the office of the Modoc County Record at Alturas, Cal.